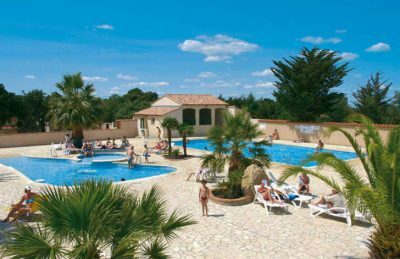 Camping La Coste Rouge is a small 3 star family friendly campsite that is perfect for family camping holidays in the south of France. Located on the southern outskirts of Argeles-sur-Mer between the town and Collioure, Camping La Coste Rouge occupies a wonderful position at the foot of the Alberes Mountains between the mountains and the Mediterranean sea. The campsite is surrounded by luscious vegetation and trees which offer both privacy and also shade from the warm sun. You’ll find a great choice of activities on-site and also close by. Water sports, horse riding, golf and plenty of stunning towns and villages can be found within a short distance of the campsite, making it the perfect base from which you can explore. Less than 1km from Camping La Coste Rouge you’ll find the stunning Mediterranean coastline. Along the coast you can explore the miles of pleasant rocky coves and inlets or visit one of the stunning beaches that line the shore. The beaches in this part of France are truly stunning offering warm waters and lots of space to relax or have fun. You’ll also find that the nearest beach has lifeguards on duty during high season. The swimming pool complex at the campsite is perfect for families of all ages. Cool off in the outdoor pool at the end of a long day or whizz down the water slide for a bit of fun. There’s also a small children’s pool and for the adults, a sauna, jacuzzi and plenty of sunbathing space. Camping La Coste Rouge campsite offers a comprehensive selection of activities and facilities on site and also nearby to ensure you have a fantastic family holiday. On site activities at Camping La Coste Rouge campsite include boules, table tennis and a playground. Facilities available at Camping La Coste Rouge campsite include WIFI, restaurant, takeaway, snack bar, bar, groceries, animation team and washers. Accommodation at Camping La Coste Rouge campsite includes a range of 2 and 3 bedroom mobile homes that are available from Canvas Holidays .